I will always remember that night. The year must have been 1980 or 1981 because the latest Star Wars movie, The Empire Strikes Back, was still playing in theaters. It was a Wednesday because my dad taught a class at the community college on Wednesday evenings, leaving me and my mom home for a weekly girls night. And it must have been spring because the evening in question included a classic spring storm. I have vivid memories of the rain coming down in sheets. The thunder was loud and voiceterous, the kind that resinates deep in your soul and makes you jump out of your skin when it rumbles. After dinner my mom and I put on our raincoats, slipped into our four door 1980 light blue Pontiac Grand LeMans, the one with a royal blue vinyl top and room to comfortably seat six. I took my place in the giant backseat, which appeared darker and more massive than usual. Our destination was Venture Discount Store and our mission was to purchase a new Star Wars action figure for my growing collection. I even remember the action figure I was hoping to acquire, the one and only Lando Calrissian! The further we traveled from home to the store, the harder the rain began to fall. My nine year old self thought the lightening was going to strike the Grand LeMans so I recall jumping from my seat and hiding behind the driver seat, laying myself flat on the floor of the car. This was easy to do since in the early 80’s wearing a seatbelt was never inforced. Perhaps the most vivid picture of the evening was the one of my mom gripping the large steering wheel so tight that her knuckles turned white. Although I could tell she was scared, she kept her cool, never complaining or showing me that she was terrified. You may think I was a spoiled little girl who got anything she requested and that my mom bent over backwards for me, filling my every wish. Although I had a blessed childhood and was clearly the center of my parents world, my mother didn’t venture out in the elements that night because she had a spoiled daughter. She had made me a promise and I had been looking forward to this adventure for weeks! I must have scored well on an assignment or an assessment or perhaps I had finally saved up my money to buy the Star Wars action figure myself. Going to the store to buy a new toy was not a regular occurrence. I can’t recall what I had done to earn the special trip to Venture but we were on a mission and my beautiful mom was keeping a promise she had made to me. Just one of the many promises she has kept and continues to follow through with over the past forty-four years of my life. That evening was the first time I was struck with unmeasurable quilt. Seeing my mom do something she wasn’t comfortable doing (in this case driving in a huge storm) to get me a toy, something so insignificant, made me feel uncomfortable. My nine year old self couldn’t articulate it at the time but I was in awe of my mom and was amazed to see that my mom loved me so much that she made a sacrifice that night, gladly putting her daughter’s joy before her own. Now that I have a daughter I realize that making sacrifices for your children is what motherhood is all about. My mom has taught me how to love and through her I have learned the importance of never making a promise you can’t keep. A mother gives of herself and never asks for anything in return. Seeing the joy on my daughter’s face is the best reward I could ever ask for. Mom, although it has taken thirty-five years to hear a formal thank you for that stormy night trip to Venture, thank you! I am blessed to have you as a mother and I hope to follow in your footsteps as I raise Lillian. I know I will succeed because I learned from the best teacher in the galaxy! A few weeks ago my father in law, Howard Talley, celebrated his 76th birthday. He was the first born child of his parents, Fraudie and Lillian Talley and grew up to be an older brother to seven siblings. That is when I realized his mother, Grandma Talley, has been a mother for 76 years! I am a new mother with a mere 21 months of experience so it is difficult for me to imagine what it would be like to be a mother for 76 years! 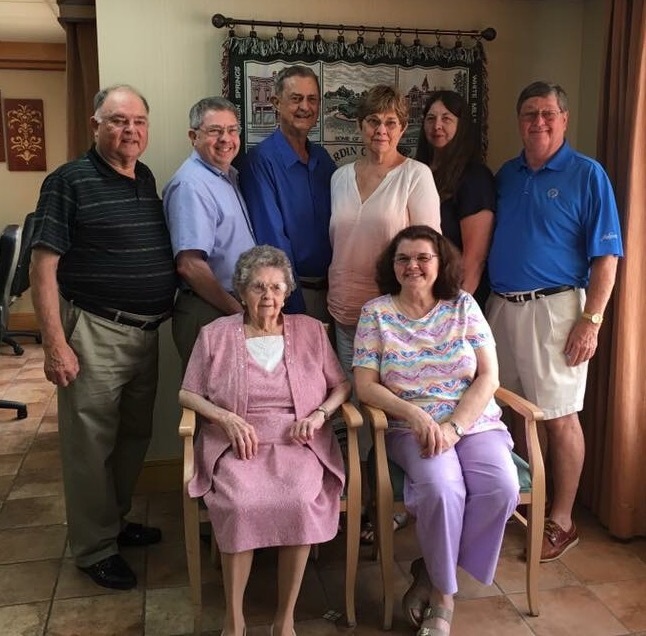 Although family roles have changed and her children are grown, Grandma Talley never stops thinking and caring about her children. From the time the Talley children were helpless infants to inquisitive toddlers, Grandma Talley provided for them. She instructed them in elementary school and encouraged them throughout high school. And they all grew up to become independent thinkers and problem solvers with huge aspirations. Their mother told them they could achieve anything through hard work and grit and then one by one they left the Talley farm in rural Kentucky, kissed their mother goodbye and began successful new chapters in their lives. I imagine having your child leave home is bittersweet. As a mother you celebrate the fact that you raised an independent adult but at the same time you mourn that little person who relied on you for everything. Although the Talley children are spread throughout seven different states they all eagerly come back to the farm to visit their beloved mother and to reminisce about their happy childhoods, passing on the family history to the next generation. Although I have many years with my little girl before she leaves her childhood home to start her adult life (she won’t even start kindergarten for another four years), I have already experienced an array of emotions as a mother. I felt pure joy when I held my newborn daughter in my arms for the very first time and a few days later I experienced frustration and pain when I desperately tried to breast feed her and found I couldn’t produce enough milk. 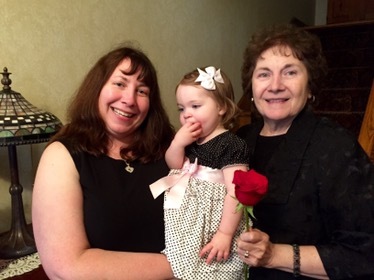 I was scared when her pediatrician detected a heart murmur at two months of age and felt helpless when at nine months she had the flu and spent two days laying listless in my arms. I was beaming with pride when she said her first words (hi and ball) and am proud at 21 months of her blossoming vocabulary which is far beyond the normal 20-50 words expected for her age. I laugh when she instantly stops what she is doing and dances to Mickey Mouse’s hot dog song and giggled when she recently requested my assistance in putting a diaper on her beloved stuffed cat. And I feel love and joy every time my daughter presses her dear little face to my cheek and gives me an affectionate kiss. I have felt tired after experiencing sleepless nights with a teething baby, been frustrated with toddler tantrums and shed a few tears when I packed up her baby bottles, onesies and rattles to make room for sippy cups and puzzles. But through the wide range of emotions I have experienced the greatest joy imaginable. Motherhood is a true blessing whether you are a veteran mother of 76 years like Grandma Talley, or a novice mother of 21 months like myself. Although I won’t come anywhere close to reaching 76 years of motherhood, I will cherish every year of motherhood God blesses me with. Once you become a mother you are a mother for the rest of your life.